Sigh.. it appears I’ve tossed my LG VX8100 phone one too many times! It’s acting very erratic lately.. powering down when I get TXT messages and whatnot.. not very good seeing as I live off of text messages!!! 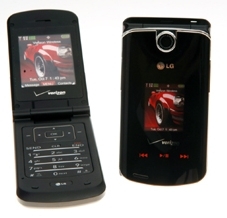 Not to worry, I just ordered my NEW phone.. an LG VX 8600.. hopefully it doesnt disappoint! It looks more fragile than my current phone.. so maybe no tossing my phone in the air from now on, eh?